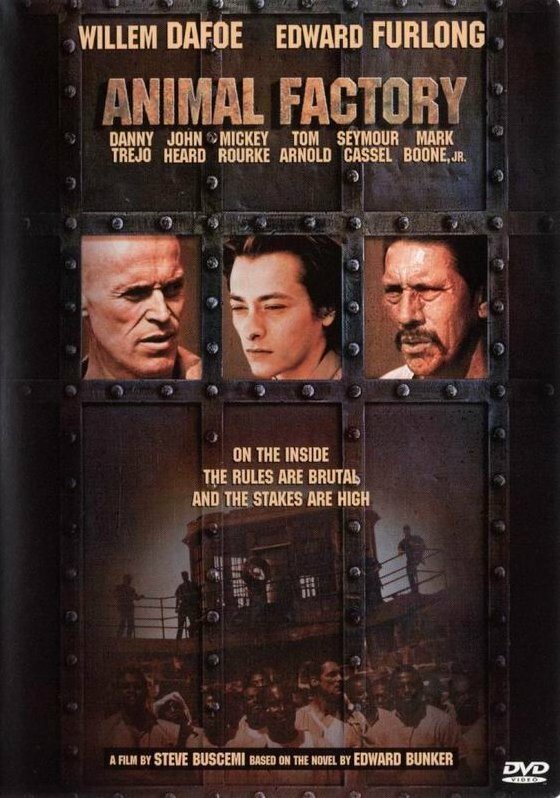 After a "third strike" marijuana bust, young Ron Decker (Edward Furlong) from a respectable family, is sentenced to ten years hard labour in Eastern State Penitentiary, a harsh grade-A prison, where stabbings occur amongst inmates daily. Guards miss the attacks and end up dragging away the injured to the prison hospital or, worse still, bringing in the body bags. Following his comparatively mild debut Tress Lounge in 1996, Animal Factory is Steve Buscemi's second film based on the novel by Edward Bunker - an uncompromising, almost docustyle look at life in a present-day US prison, through the eyes of a young rookie befriended by a veteran Earl Copen (a shaven-headed Willem Dafoe) whose motives are shown to be curiously ambiguous. Initially, Decker's entry into this underworld governed by rival gangs and racist factions causes anxiety. With his fresh-faced and boyish good-looks Decker becomes the object of unwanted attention, especially in the showers. His introduction into the shady world of Copen, so well connected that at one point he boasts that "this is my damn prison", causes a different kind of anxiety. Why does Copen befriend Decker? Will Decker get into bad ways thorough the intimidatory tactics that Copen adopts to get his way? Should Decker pay more attention to his jailbird transvestite cellmate "Jan the actress" (Mickey Rourke in drag) whose very exclusion from the gang world at least keeps him out of trouble? Will Decker ever be able to persuade the parole board (led by a suited Buscemi in a smaller role) that he is worthy of release or will his exploits in Copen's gang, count against him? Animal Factory should keep you guessing until the final reel. As prison dramas go, it does have a few surprises up its sleeve. Performances are uniformly strong with Dafoe and Furlong giving every ounce to reveal how the bond develops between their two characters.